HOUSTON, Texas - Frater Jim Crane (Delta-Lambda, Univ. of Central Missouri, on right of picture) learned persistence playing baseball in his youth. Turns out, he needed it. The Houston businessman failed three times to realize his dream of buying a major league baseball team. On Monday, his attitude paid off when Houston Astros owner Drayton McLane announced that he had agreed to sell the team to a group led by Crane for $680 million - the second-highest price in major league history if it is approved. "Each time we tried it was a little difficult," Frater Crane said of his efforts to buy the Texas Rangers, Chicago Cubs and, yes, the Astros. "I'm accustomed to winning. So we set our sights on winning and we never gave up." The sale is subject to approval by Major League Baseball, a process officials said could take at least 30-60 days. Upon approval, his group will become the fifth ownership group in charge of a team founded in 1962. The sale price trails only the $845 million purchase of the Chicago Cubs by the Ricketts family two years ago. The $660 million sale of the Boston Red Sox in 2002 currently is second. Like the Astros' deal, the Cubs and Red Sox transactions included related entities. A major selling point was the Astros' share in a new deal with the NBA's Houston Rockets to create a regional sports network that will begin airing Rockets games in 2012 and the Astros in 2013. Crane said the team's 30-year lease at Minute Maid Park, which is owned by the Harris County Houston Sports Authority, will remain intact under his ownership. 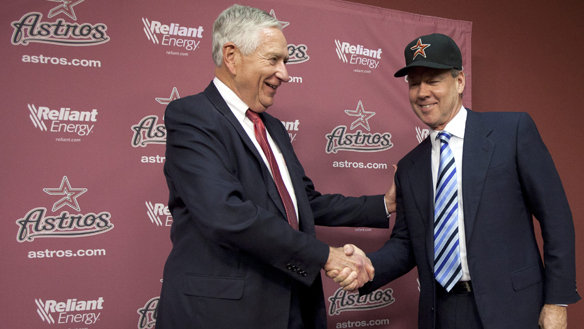 Crane wanted to buy the Astros three years ago, but that didn't stop him from trying again when McLane put the team for sale. He was a bit overwhelmed by the reality of finally reaching his goal when he was introduced by McLane and presented with a black Astros baseball cap that he wore for maybe a minute before removing it and clutching it as he spoke. "I got a little emotional up there," he said afterward. "It's going to be a lot of fun and we're going to do our very best to put a good product out there. It's a dream come true." Crane played baseball in the 1970s at Central Missouri State, now known as Central Missouri. He was a solid pitcher who ended his four-year career with a 21-8 record and 2.42 ERA. "Baseball has had a big impact on me from the time I was little and for the better," he said. "From that moment, it has helped me gain confidence and has taught me discipline and it has taught me to work hard ... I will use all those lessons moving forward with the Astros." Crane's group includes nine other principal investors, though it was unclear if McLane will retain a minority stake. McLane said he wouldn't divulge that information until the sale is approved. McLane bought the team in November 1992 for about $117 million and put the franchise up for sale in November. He turned down Crane's overture in 2008, but said he thinks the team will be in good hands once the deal is completed. Crane, who founded a Houston-based logistics company in 2008, is also the chairman and chief executive of Crane Capital, a private equity fund company. In 2009, he was in the running to buy the Cubs and last summer teamed with Dallas Mavericks owner Mark Cuban in an unsuccessful bid to buy the Texas Rangers. "If you're an old baseball player you never give up," he said. "You're not going to win every game. So we stayed at it, we stayed focused and we didn't give up." Adapted from an Associated Press story. Be sure to follow the latest TKE News with the RSS Feed, on Twitter or the official TKE Facebook Fan Page (Tau Kappa Epsilon Fraternity). Submit your news today.